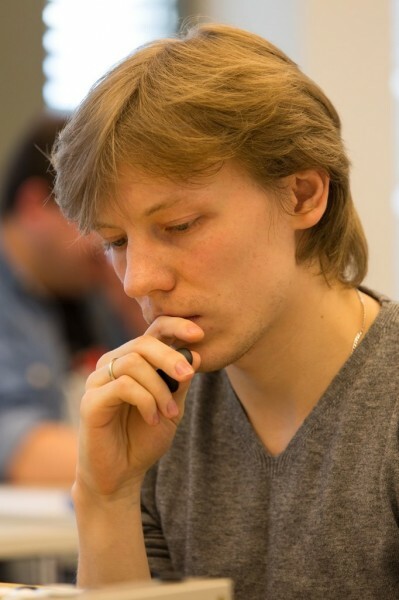 Ilya Shikshin 1P has won the 2016 European Championship title, defeating Ali Jabarin (1p, Israel) at the 60th European Go Congress in St Petersburg. This is Shikshin’s fourth European Championship and the win makes the Russian the third most successful European player, in terms of all titles won, behind Guo Juan and Alexandr Dinerchstein. Fan Hui had won the last three years but has been at the US Go Congress this week. Shikshin said he was “delighted” to reclaim the title, noting that “All the matches were memorable in their own way. I had to be enormously involved in my games and when you are involved, the matches become very emotional.” Lucas Podpera (Czech Republic) took third place, beating Mateusz Surma in the play-off. Click here to see video of commentary on the final by Wu Hao 2P and Li Cong 3P with Vadim Efimenko 3d.